Before we went to Greece we took a class on Greek cooking at Sur La Table. It was a great class and we learned how to make 4 dishes. This is our favorite one. It is really easy to make and the flavor is great. In a large skiller, heat oil over a medium heat. Add the onions and garlic and saute for 3 minutes. 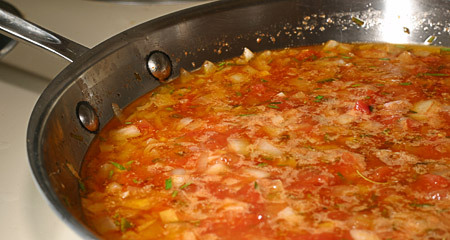 Add canned tomatoes, tomato paste, ground pepper, wine oregano, parsley and 1/2 cup of water and mix well. Bring to a boil and then reduce heat to a simmer. Cover and simmer, stirring occasionally, for 20 to 30 minutes. Add more water if needed to thin sauce. Preheat oven to 375F. Lightly butter a baking dish and place some the sauce on the bottom. Place shrimp in the dish, cover with remaining sauce, and sprinkle with feta cheese. 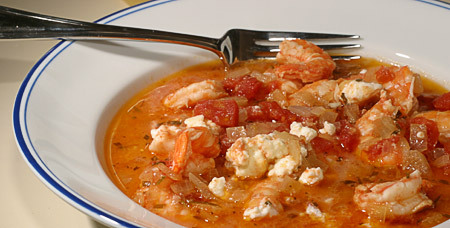 Bake for 15 to 20 minutes or until shrimp are done and feta starts to melt. I made this today for dinner it was the most amazing dinner i ever had thanks to this recipe! We actually just made this again recently…. it came out great! I had forgotten how good it is! After step 2 (before you add the tomatoes) add shrimp and flame off with a quarter cup of cognac and a bit more of ouzo or any anise liquor. When flame is exhausted, add tomatoes and warm (do not overcook the shrimp!) Then put in a dish a la step 4. From the NYTimes International Cookbook of the early 1960s. Another great way to serve this is to skip the oven part, cook white rice, put the rice in individual soup bowls (large shallow work better than small deep), spoon the tomato/shrimp mixture over the rice, and crumble the feta cheese over the top. Great idea! Im going to have my wife make this dish tonight. Good question Nikki, I actually used dry white vermouth. I think I used the full amount even. I like cooking with it because you can keep the bottle open for about a month before it goes bad… unlike wine. That and it is cheap! Looks wonderful! And not difficult. What wine did you use?